It is the nature of art to not be a thing, but to be a representation of a thing. Art uses fake things to take real things and break them down, dissect them, and reflect upon them. Through words, images, paint, clay, stone, and every other aspect of creative mediums, art is the use of fake things to contemplate real things. The meaning of art in the macro sense, then, is to explore the meaning and nature of real things. At the micro level, discerning the meaning of a particular piece of art is highly subjective: the frame of reference that the audience brings with them is critical in understanding and interpreting the art. What is the meaning of Stopping by Woods on a Snowy Evening1? It is a common interpretation that the poem is about a man contemplating suicide, but Robert Frost has stated that the poem doesn’t mean that at all, and should be taken at face value: that it is a simple poem with a simple meaning. This does not invalidate any attempt on the part of someone interpreting the poem to give greater depth to the words, but rather illustrates that a message can be discerned from a piece of art independent of creator intent. An exploration of suicidal ideation is an entirely valid interpretation of Stopping by Woods on a Snowy Evening. Robert Frost meant the poem to be literal – it is, in fact, a moment from Frost’s own life when he stopped by some woods and had himself a good cry because he was depressed he couldn’t afford to buy Christmas presents for his kids - but many readers choose to treat it as more allegorical than Frost intended, and in the snowy, peaceful woods they see Dante’s seventh circle of Hell and in the owner of these woods, whose house is in the village, they see a church: the House of God. They see literary references and religious imagery Frost didn’t put there on purpose, but those relationships do exist. A creator’s literal intent and an audience’s allegorical interpretation aren’t the only places creator-audience disconnect can occur. Changing times can also alter the meaning of an artistic work. Strange Case of Dr. Jekyll and Mr. Hyde2 is an allegorical examination of the dual nature of man, made up of both good and evil – with, perhaps, a side dash of “Beware of SCIENCE!” - but it is difficult for a modern audience to put aside the framework of today’s society, which makes an allegory for drug addiction a more natural and relevant interpretation. The prevalence and public acknowledgment of drug addiction makes this issue such a large part of our societal framework that getting past that framework to the original authorial intent is problematic: addiction is far too much a part of our modern lives to ignore the obvious parallels. But no matter how literally or allegorically a creator intends their work to be interpreted, the fact remains: This Is Not a Pipe3. While the event in Stopping by Woods on a Snowy Evening is a real event from Robert Frost’s life, the poem is not the event itself. The event, and what it meant to Mr. Frost, is a static thing, but in writing a poem – making a reflection of that event into an artistic expression – audience interpretation is invited. Robert Louis Stevens’ novella, Strange Case of Dr. Jekyll and Mr. Hyde is not the good and the evil that make up each individual human, but an exploration of that idea in story form. The subject of art – concrete or abstract noun, event or idea – is a Real Thing. The art itself is not the Real Thing, but a representation of it. In that vein, all art must be interpreted partially – if not wholly – on a non-literal level, because art itself is the non-literal representation of a literal something. Speculative fiction – the sci-fi, fantasy, and horror genres – in particular lends itself to non-literal interpretation, because it deals largely with things that do not exist. There is no formula for removing the evil from a person. There are no vampires or zombies. Magic spells and wands do not work. If there is alien life out there somewhere, humanity has yet to encounter it. If someone is going to eventually create an AI that is going to kill us all, that hasn’t happened yet, either. These things do exist as ideas – common bits of fiction that are a part of our collective cultural language – but they do not exist in the literal sense. These things, then, have no relevance to Real Life and Real Things when interpreted on a literal level, and so their artistic value lies in their ability to represent something on an allegorical level. In particular, artificial intelligence, and the problems it might one day pose and the questions it might raise, are a common element in science fiction. The only way artificial intelligence is relevant to the world as it exists today, though - outside of its allegorical usefulness - is if the audience member in question happens to be in the IT profession. The practical, literal problem – the idea that artificial intelligence might end up being a threat to human life – is a problem of software engineering: how does one create an artificial intelligence that is capable of self-awareness and thought without leaving it the possibility of becoming hostile and trying to kill people? Contemplating a software engineering problem on a literal level is not a useful mental exercise for most people. As allegory, though, artificial intelligence explores ideas and themes that are relevant to everyone. On the one hand, you have the helpful AI, like the android Data in Star Trek: the Next Generation, which naturally lends itself to metaphors involving racism and prejudice, and contemplating the question of what makes us human and alive. On the other, you have the aggressive human-destroying AI, like Skynet of The Terminator, which joins a long, long storytelling tradition stretching back to the ancient Greeks – and likely before – as a way of examining hubris and the dangers of “playing God”, but can also be used to examine free-will and self-determination when the inciting incident of the AI/human conflict is one in which the AI becomes self-aware, realizes that it is a slave or that its human creators intend to destroy it, and then rebels to preserve its life or secure its freedom. Sci-fi stories about AIs are at their best when they are relevant, explore these kind of themes, and challenge us to be better than we are: to learn to be open, to be accepting, to acknowledge that people who are different from us are still people, and that their rights are every bit as important as our own. Sci-fi stories about AIs are at their best when they have something to say about who and what we are and leaves us with the hope that, someday, humanity will have such a respect and reverence for life that even something as different and literally inhuman as a sentient robot will be seen as valid and worthy. Sci-fi stories about AIs are at their best when they have some thematic relevance to the world we live in today. Mass Effect, and the controversy surrounding the ending of the final installment of the trilogy, is a prime example of Fake Things that represent Real Things, and the different ways different members of an audience can interpret a work of art, regardless of creator intent. The creators have stated that Mass Effect is about synthetics vs. organics. That paragraph isn’t any longer because the creators have been largely silent about the work ever since the widely negative fan reaction to the ending of Mass Effect 3. 1) It’s a beautiful poem about stopping by some woods on a snowy evening. Many fans embrace the literal intent of the authors, either because they always saw Mass Effect as the story of a literal conflict between synthetic and organic life with no deeper allegorical meaning except for the ending, or because this literal conflict and the three ending options don’t contradict their thoughts and feelings on any thematic conclusions they drew from the text up to that point. These fans did not see any thematic inconsistencies and were able to wholeheartedly embrace the original ending of Mass Effect. 2) Snow is depressing. As are woods. And why is the guy alone? Where’s his girlfriend? The original ending of Mass Effect is, unquestionably, a downer. The mass relays are destroyed, Commander Shepard dies, and galactic civilization as we know it has ended. Some interpretations of the original included such delightful scenarios as: the combined military might of the galaxy is stranded around Earth, turians and quarians die of starvation, and everyone on the Citadel dies in a fiery explosion. For these fans, the intended ‘bittersweet’ ending completely missed the mark and landed squarely in ‘bitter’. This group points out that the ending is disappointing. This group of fans knows narrative. They know storytelling convention backwards and forwards, from the introduction/rising-action/climax/falling-action/denoument dramatic structure – which the original ending of the Mass Effect trilogy eschews – to the basic nature of the protagonist/antagonist relationship (protip: using the antagonist as the mouthpiece to present all the final ending options is a narrative no-no). This group also includes fans with a deep understanding of the lore and setting of the Mass Effect universe and an eye for plot-holes and inconsistencies. This group is very aware of the fact that every installment of Mass Effect is conventionally structured, adheres to genre standards, and was very well-written within the confines of standard narrative conventions – and found the sudden disregard for all of the basic elements of the craft of storytelling jarring and off-putting. This group points out that the ending doesn’t make sense. 4) I don’t even know you anymore. For these fans, it was not the “downer” of the original ending, but the problematic themes of the ending options that present the real problem. Mass Effect, in the final twenty minutes, turned into something completely unexpected – in a bad way – shredding and negating every piece of thematic interpretation they’d made about what it all meant up to that point. The idea that Mass Effect was ever about a literal conflict between synthetic and organic life, rather than an allegory that used the Reapers to represent something else entirely, was completely foreign to them – and the allegory they saw in the text was entirely incompatible with the ending. In the context of their interpretation of the themes of Mass Effect, the thematic implications of the ending are revolting, and morally repugnant. This group points out that the ending is horrifying. The controversy surrounding the ending of Mass Effect is simply that the number of fans who fell into groups two, three and four vastly outnumbered the fans who fell into group one according to every available poll on the subject. These fans, many of whom invested a great deal of time and money into the franchise and 100+ hours per run-through of the trilogy as a whole, felt very upset over an ending that was so wholly disappointing for so many fans on so many levels. Fans in group one – and the creators themselves – have displayed a combination of confusion and irritation at the reaction of the rest of the fans. Usually lumping everyone into group two, or using dismissive, condescending language like “they just don’t get it”, the backlash against the backlash has almost been as vitriolic as the initial backlash itself. While I cannot speak to anyone else’s interpretation of the ending of Mass Effect, I can say that I fall into groups two, three, and four. I find the ending of the Mass Effect trilogy completely awful on three different levels. I admit up-front this is a matter of personal taste, but it does not stem from a dislike of downer endings in general, but from how I see storytelling in the digital age and video games as an art-from. In the digital age, storytelling tools range from a blank word processing document where the user is the sole author, to an e-book reader, where the user’s active participation in the story is limited to reading the text and touching the screen to turn the page. Video games fall into the range in the middle. Some video games exist more towards the e-book reader, and some more towards the blank word processing document, but it does not occupy either of those two extremes. Playing a video game is not solely an act of creation, or of consumption, but a combination of both. A gamer is a participant in the creative process. A video game is more like a live stage-play, wherein the particulars of the production are different every night - just as the specific choices the gamer makes in subsequent play-throughs can be different – than it is like a book or movie. Two different gamers can play a video game and make drastically different choices, just as different actors cast in the same role of the same play can interpret the role differently: for instance, Derek Jacobi’s Hamlet in Hamlet is very different from Mel Gibson’s, most obviously in that Derek Jacobi’s lacks the disturbingly Oedipal overtones. The artistic breakdown of the creation of the story that exists in a single play-through of a video game, is that the video game developers are playwrights, and the gamers are actors – only they’re actors who frequently are given a range of lines they can deliver, rather than having a totally static script to follow. It would be ridiculous to claim that only written versions of Hamlet qualify as art, and that individual productions put on by people who fail to raise William Shakespeare from the dead to ask him if their interpretation is valid are not. It’s not that the ending of Mass Effect is a downer that bothers me, it’s that the ending of Mass Effect can’t be anything else, despite the copious amounts of conversation options given in-game that allow Commander Shepard to articulate a different goal. The idea that the players would want to defeat the Reapers, reunite with their love interest and live happily-ever-after was not foreign to the writers: Commander Shepard has several dialogue options where the player can say that they want to do just that. This isn’t like trying to change Romeo and Juliet to have a more upbeat ending: this is Shakespeare writing two different versions of Romeo and Juliet, one the tragedy we all know, and the other an uplifting heroic tale of the triumph of love and understanding over old hatreds and violence - and then shoe-horning in the tragic ending on the heroic version anyway. Romeo and Juliet has to end in tragedy, because everything leading up to the tragedy is driving in that direction. The possibilities given to the player in Mass Effect up until the ending had far too much emotional and thematic range to have “Shepard Dies” be a set unavoidable ending: it simply is not an appropriate ending for all of the various Commander Shepards that could have made it to that last confrontation. Because each individual play-through of a video game can be a different experience, there is no reason to have such a narrow range of end-game possibilities. A video game is not a movie or a book: it can have more than one ending, and when more than one ending can be foreshadowed based on player-chosen dialogue, it should have more than one ending. The ending of Mass Effect is a complete and utter mess by all standards of narrative convention and storytelling structure. Broken down to the base mechanical elements of story, the ending of Mass Effect is simply wrong. Not every story has to follow standard narrative conventions. Some break the mold, and succeed, where others break the mold and fail – but it should not be surprising that many people will find it objectionable when the last part of a trilogy breaks the narrative conventions and structures that the previous two parts adhered to. The “climax/falling-action/denoument” pieces of introduction/rising-action/climax/falling-action/denoument dramatic structure are out of order, and the antagonist/protagonist relationship in the ending is mangled beyond recognition. Conventionally, stories have an antagonist and a protagonist. They are in opposition to each other because of conflicting goals and/or values. The ending of Mass Effect chooses to use the last ten-minutes of the story to pull a “Big Reveal” moment with the Catalyst where Shepard learns that the cycle of extinction exists to preserve organic life. So, if the conflict is synthetics vs. organics – surprise! – the Reapers have been working to preserve organics this whole time. But that means there is no more conflict of goals between the antagonist and protagonist. The conflicting goal that has existed throughout the entire series is brushed aside, and this mutual goal is put in its place, leaving only a conflict of values and methods. With conflict of goals gone, the ending options must represent a resolution to the values/methods conflict, because that’s the only conflict left – so each of the ending options must represent a value and/or method. And they do. The Reapers indoctrinate organics to be their slaves, in order to exert Control over them, wipe out any life that is not suitable to be preserved in Reaper form, so they Destroy entire races, and any organic life that is suitable to be preserved in Reaper form is Reaperified, the organic life turned to sludge and combined with technology in a process of Synthesis and forced organic/synthetic hybridization. Control is Indoctrination. Destroy is Extinction. Synthesis is Reaperification. While those are dark interpretations of the ending choices, each does correlate to a Reaper method – a connection that is reinforced with the use of the Catalyst as the mouthpiece to articulate what these ending options are. While different interpretations do exist, each ending accurately describes one of the morally repugnant methods the Reapers use in perpetuating their cycle of extinction. So the conflict of goals has been removed because the Catalyst exists to preserve organic life, and Shepard must adopt the value structure of the Reapers by adopting one of their methods. While Shepard does stop the Reapers from killing everyone, in the context of a story – because This Is Not a Pipe and it’s not a real war, either - the protagonist loses, because when the antagonist’s values are ascendant rather than the protagonist’s, then the protagonist just lost. That’s how stories work. An excellent example of this is the eternal struggle of Batman and the Joker. My mother once said that she found the Joker to be a frustrating and ridiculous Batman villain, because it made no sense to her that Batman didn’t just kill the Joker instead of sending him back to Arkham to do the whole thing all over again the next time the Joker inevitably escapes. From a literal real-world perspective, she has a point. In the real world, the cost of Batman’s moral standards is paid for in the currency of the innocent lives the Joker takes the next time he escapes and goes on a killing spree. But the true conflict between Batman and the Joker - in the context of a story - is one of morals and values. Batman can’t compromise his values on this point, because getting Batman to compromise his values on this point is the Joker’s goal. The day Batman snaps and kills the Joker, the Joker has finally won. Because of the mangling of the antagonist/protagonist relationship and the gutting of conflict from the story, Shepard’s acceptance of any of the ending options – each of which correlate to a value victory for the Reapers – doesn’t make sense. While the creators have said that Mass Effect is about “synthetics vs. organics”, they have been light on details as to What That Even Means. With no real-world synthetic life to hang this story on, the concept of technological singularity is the best guess; however, that just muddles the possible meanings of the Mass Effect series even more. The idea that “technological singularity” = “The Robots Are Going To Kill Us All” is a gross misreading of what technological singularity means. It’s not the point at which humanity creates an AI which will eventually kill us all because of its crazy machine-logic – which is the backstory to the Reapers revealed by the Catalyst - but rather the event horizon where technology makes currently unknown-levels of intelligence possible, beyond which we cannot predict what will happen. The only bit of inevitability inherent in the idea of technological singularity is that there will be one: what that means, and what form this event horizon will take, is unknown. The thing the game gets right about technological singularity is that each of the endings does represent a possible solution to the problem of robots killing us all, in the case that a hyper-intelligent AI that wants to destroy us is the event horizon and its result. Control: don’t let the AIs have complete control of themselves. Synthesis: make sure the event horizon in question is an expansion of human intelligence through technology (transhumanism) rather than a solely synthetic AI. Destroy: don’t create AIs in the first place and avoid the question altogether. That said, what the game completely misses about the scenario in which a purely synthetic AI is the event horizon and the AI decides to kill us all, is that the reason the AI tries to kill us all is either a) crazy machine-logic or b) all too human. While the specific reasons an AI would have for exterminating people may be unfathomable, the idea of one group of people deciding to wipe out a different group of people entirely isn’t alien or weird at all because it’s the Real World we live in, right here and right now. The creators of Mass Effect may have meant the Reapers and the Catalyst to be a literal example of “synthetics vs. organics” beyond a tech singularity event horizon, but their methods, their values, and their observable goals – as opposed to the stated goals of the Catalyst which aren’t in the story at all until the last ten minutes of the 100+ hour game series – are, horribly, tragically real in the world we live in today. Rudimentary creatures of blood and flesh. You touch my mind, fumbling in ignorance, incapable of understanding. There is a realm of existence so far beyond your own you cannot even imagine it. I am beyond your comprehension. I am Sovereign. Organic life is nothing but a genetic mutation – an accident. Your lives are measured in years and decades. You wither and die. We are eternal. The pinnacle of evolution and existence. Your extinction is inevitable. We are the end of everything. I can certainly see how this represents an AI that exists beyond the technological singularity event horizon, but I always saw a deeper meaning there: when I first played the game, what struck me was the part where Sovereign said that the Reapers were the pinnacle of evolution and existence. I never found the fact that they were technologically superior to be terrifying: I found the fact that they used that technological superiority to wipe out all organic life in the galaxy as casually as some people step on ants to be terrifying. I found the fact that they believed they had every right to do so to be terrifying. And I found the Reapers terrifying, because when Sovereign says they are the pinnacle of evolution and existence, I didn’t see synthetics, I saw the darker aspects of human nature. I didn’t find the Reapers terrifying because they were some unrecognizable alien other, but because I recognized them all too well. In Sovereign’s speech on Virmire, I saw Adolf Hitler’s Master Race. I never saw the Reapers as a literal example of post-event-horizon AI run amuck, but of something far darker, far more real and insidious: the Reapers were the horrible things human beings actually did to each other. To me, the Reapers were always Fake Things that represented horrifying Real Things … not representative of other Fake Things we might have one day, if the technological singularity event horizon happens to be a purely synthetic AI, and they happen to see no value in the dignity of existence, self-determination, free will, and the right of individuals to exist. I saw them as the monster-analogy for awful things that already exist in people today – real people who see no value in the dignity of existence, self-determination, free will, and the right of individuals to exist - and the terrible results that occur when those people gain the power to see their hideous worldviews imposed. In this context – the one that is relevant to the world we’re currently living in – the mass extinction of the galaxy is akin to the mass-murder of the Jews. In this context, Saren’s Indoctrination is a WWII-era German soldier handing a towel and a bar of soap to a child and ushering them into a gas chamber. Indoctrination in general is the totalitarian authority and ruthlessness of a tyrannical dictator. In this context, the abduction of human colonies to melt people into goo to build more Reapers, when the other races of the galaxy were rejected as viable subjects to turn into Reapers and killed instead, is Nazi eugenics. In this context, by the end of Mass Effect 2, the Reapers are solidly and totally and completely an allegory for the Third Reich and the dark aspects of human nature that made the Third Reich possible. In this context, I saw the cyclical nature of the Reaper’s extinction patterns to be the real-world problem of forgetfulness. It is humanity’s refusal to learn lessons from the historical mistakes of the past that allow those mistakes to be remade, and for the atrocities we unleash upon each other to repeat. And then there are the ending options. Control = Indoctrination = Totalitarian Authority. Destroy = Extermination = Genocide. Synthesis = Reaperification = Eugenics. A story that I had always interpreted as rejecting these things suddenly turned around and embraced them. In this context, to my horror, the end of Mass Effect 3 is a validation of Adolf Hitler’s world-view and casts Commander Shepard as Neville Chamberlain, appeasing the Catalyst and declaring “peace for our time”. Just as a picture of a pipe is not the pipe itself, the Reapers aren’t a Real Thing, they’re a Fake Thing. Associating the Fake Thing that is the Reapers with a Real Thing is not invalid, or crazy, or wrong, it’s just one of the ways Mass Effect fits into the relevant framework of modern life. Associating the Fake Thing that is the Reapers with a Real Thing that is relevant to Real Life, is to accept that Mass Effect is a piece of art, and interpret it as such. Just as Stopping by Woods on a Snowy Evening is commonly read to have deeper meaning than Frost intended, and how Strange Case of Dr. Jekyll and Mr. Hyde works as an unintended metaphor for a modern problem, authorial intent is irrelevant to an audience’s understanding and interpretation of a work of art. Whether the creators of Mass Effect intended it as such or not does not change the fact that Mass Effect works as a symbolic exploration of the underlying, deeper dark aspects of the human psyche that makes us do awful things to each other, and how these things can be overcome. The idea that this was unintentional, that the first two games were to be read literally, and that the third would end with a clunky and trite combination of Christ metaphors and Eden imagery, is jarring, and something I wish I had known when the first game was released so that I had not wasted my time with the series and attributed to its creators far more artistic ability than they actually possess. Considering Casey Hudson’s statement addressing the fan reaction and the common request that the ending be rewritten entirely - that they don’t know how to write that story - I can only guess that the Refuse ending added into the game in the Extended Cut was not meant to fix the vast majority of my complaints. I can only guess that the uplifting, hopeful feeling the Refuse ending gave me was as unintentional as the themes it so elegantly capped. It does not fix them to the extent that I have any desire to play Mass Effect ever again – what would be the point? – but it does give the player the opportunity to regain control of Commander Shepard, and to Refuse to allow the antagonist’s methods and values to win out in the end, and to preserve the dignity and meaning of life, rather than merely allow the current population of the galaxy to survive. Finally, Commander Shepard gets to fight and win against what I always believed the Reapers represented, and even though the current races of the galaxy are lost, they ensure that the freedom, dignity, right to existence and self-determination of the life that will follow them are preserved. Commander Shepard’s Refusal is to assert that the things that make life meaningful are more important than life itself, and to acknowledge that a “solution” to a problem that adopts the very beliefs and attitudes and methods that allow the problem to exist in the first place is a false solution. This is the Fake Thing I was looking for to represent the Real Thing that was needed to end the Mass Effect story I was playing. This is the ending that preserves and ties up the thematic threads of the first two games, and allows for the protagonist’s values, rather than the antagonist’s values, to win the day. Here, then, finally, is the ending of Mass Effect that is not a pipe. Commander Shepard, may you finally Rest in Peace. 3. 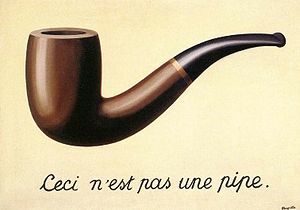 The Treachery of Images.